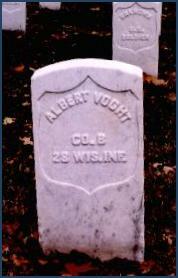 Information from the National Cemetery at Little Rock was cross-referenced with a 28th Wisconsin roster to find the date and place of death for each soldier. In every case, except for Capt. Mandeville Townsend, the soldier died of an unspecified disease. Throughout the War, death from disease took a greater toll on the 28th Wisconsin than did death caused by wounds received in battle.